Following a fruitful discussion with the President of the National Union of Eritrean Women (NUEW), Mrs. Tekea Tesfamichael, last Thursday, today’s issue will give a glimpse of our conversation focusing on the role of women in the Eritrean society, the challenges, opportunities and the need to exert efforts in regards to Eritrean young women. Mrs. Tekea welcomed the local media to discuss further the outcomes of the National Symposium held on 29-30 June 2017 in Asmara. Under the theme of “Eritrean Women in a Quarter of a Century”, the symposium brought together stakeholders from ministries, the PFDJ and civil society groups to analyze research papers focusing on gender, and, in particular, on women and girls in the fields of education, economic empowerment, social services and equal access and political participation among others. The national symposium was a success for the NUEW as “it managed to bring major stakeholders together to discuss and debate important issues related to gender and mainly on youth”, said Mrs. Tekea. The symposium was the continuation of previous reports prepared every five years. This platform for debate came at a critical juncture, i.e. in line with Eritrea’s new phase of development. Accordingly, “assessing the participation of women and girls as well as ensuring their rights as citizens are key for future growth”, she continued. 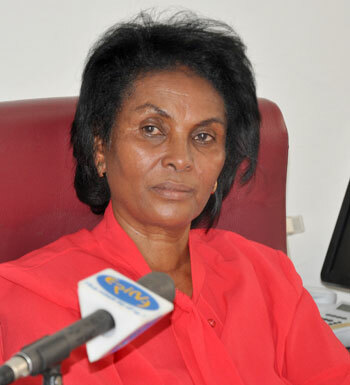 Eritrean women played a historical role during the struggle for independence. Some may fought alongside their male counterparts, some went abroad and set up Eritrean Women’s Union in the diaspora, some worked as spies in cities for the front while many mothers would send their sons and daughters to join the front and many would sell their jewelleries for the Eritrean cause. The president of NUEW said that the work of the union continued after independence and has been working for Eritrea’s sustainable development. The work of the union depends on the collective participation of all citizens. The conference was organized in order to create or strengthen a sense of responsibility and sensitize stakeholders to the issues of gender..
Mrs. Tekea looked at the situation of women according to the different pillars for the nation’s development. One of these is education. In this sector, the NUEW assessed the participation of girls from elementary to tertiary education. Female students’ enrolment is at a national average of 45%. It is a positive result ensuing from the Government’ policies of ensuring education for all without discrimination of gender, religion or ethnicity. In this sense, the participation of women continues to grow. In terms of health, “the mother is the one who would bring her child to be vaccinated and if she is not aware of her rights or duties to visit health centres, the household and the society would suffer”, the president added. In this area, sensitizing communities constantly is essential for the women’s union. By working with the Ministry of Health, the union helped in the construction of health centres, clinics and hospitals in remote areas nationwide. The union is also working to ensure that citizens abide by the laws prohibiting child marriage, Female Genital Mutilation and Cutting (FGM/C) and other harmful practices affecting young girls and women. Mrs. Tekea also looked at the economic participation of women within the agricultural sector and labour in general. This important pillar for development needs to be given priority. Economic empowerment continues to be a challenge for Eritrean women as it is the remedy to move from a passive status towards an active one. “How do they use the opportunity given in agriculture for instance? What are the local governments doing?” she asked. These important questions she raised brings the issues towards the right implementation of policies at grassroots level. In fact, the 118/2 Labour Proclamation of Eritrea states clearly that the right to work doesn’t differentiate gender. However, cultural beliefs remain in some areas and the union including partners and government bodies, have a key role to play in ensuring the right application of Eritrea’s policies. “In terms of rights, laws, proclamations, the rights of women are clearly articulated, nothing to worry about in this respect. The problem is in practice, where cultural beliefs and the social construction of gender are challenges”, she said. Access to the labour market is one aspect and the level of employment and sector is another issue. According to the statistics provided in 2005 by the Ministry of Labour and Human Welfare, women workers in tertiary level are 18.8% while male in this sector account for 81.2%. The trend continues to show similar results where women are the majority confined into lower level jobs, mostly in production line. They are subject to lower salary and longer hours of work. “We need to create a sense of competitiveness to those women”, the president of NUEW stated. “Why can’t she run machineries, why can’t she be the manager if she has the capacity?” she added. Nonetheless, the trend is slowly changing. Women at work are progressively increasing in line with the high number of female graduates in various fields as well as the number of women engaging in micro-credit programs throughout the country. This topic brought the discussion further to the root causes explaining why women continue to be at lower scale employment. There comes the question of social consciousness raising regarding the importance of female participation in the world of work in addition to creating facilities for those women. The last point is critical for increasing women’s employment. Mrs. Tekea stated that “women are child bearers and there is a time in life when marriage would come. What our people need to understand is that women can be both mothers and workers”. This important point made during our conversation is crucial in today’s Eritrea. Many young women would be married because of family constraints without actually being mentally and physically prepared, for instance. Others remain absent from work after delivery and become housewives. “If you have a degree but you don’t use it, it’s a waste not just for you and your family but your society as a whole”, the president added. By creating day cares within all ministries and private companies as in the Ministry of Transport and Communications, the National Insurance Company and Za.ER Plc, the burden of many young mothers could be lessened. With the numerous achievements in regards to women empowerment and gender equality, the Government is exemplary in comparison with other African countries. The question now is do we understand our laws and policies correctly? This is where challenges remain and require further efforts. The national symposium highlighted this. “The papers presented during the two-day event are not to be put in shelves but instead they are guiding our working plan”, Mrs. Tekea said. Accordingly, the NUEW, in partnership with ministries and civil society groups, is putting a great focus on economic empowerment. To achieve greater results in this sector, strong sensitization campaigns are planned requesting the active participation of all stakeholders. Engaging young women further and ensuring their level of consciousness is another related challenge that the NUEW is looking at. “The understanding of the importance of the union among young girls started to be a bit worrying; thus, our target group is young women and girls”, she further said.